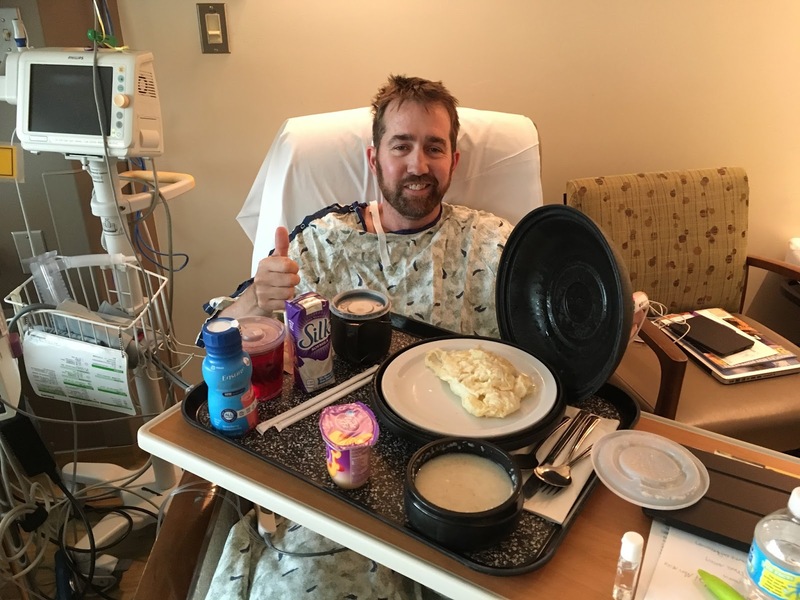 This is the second in a 3-part series chronicling Justin's journey with Crohn's disease so far. The story gets personal, and may be TMI for some people. Be warned. The first post was focused on J's history of Crohn's from his perspective. 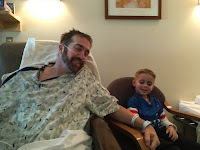 This second post is about J's Oct. 18 surgery and the 10 days in the hospital that followed from both of our perspectives. 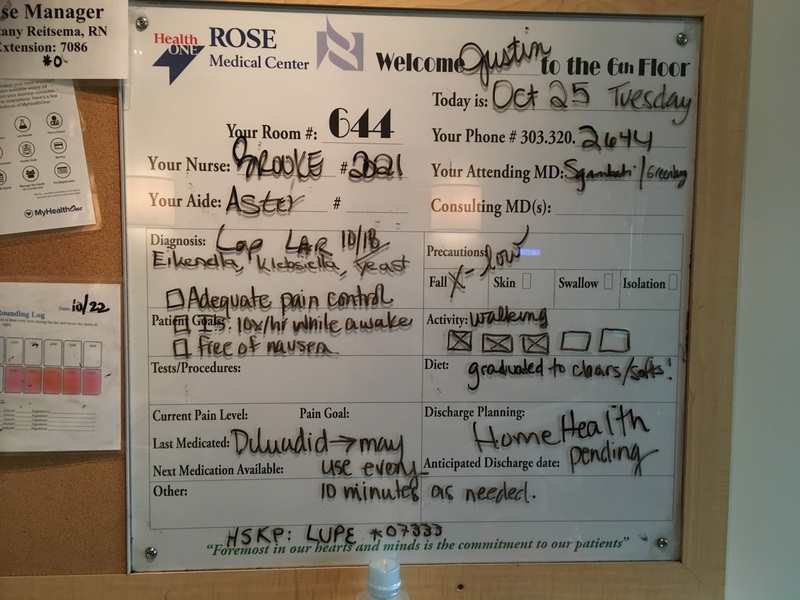 On October 18, 2016, at 7:30 am, I (Justin) laid on the gurney and was pretty relaxed, not because of any drugs, but because the Rose Medical Center staff was so nice and informative. The anesthesiologist told me everything she was going to do and promised I wouldn't remember a thing. I wasn't scared or nervous. I then tipped back the cup with some pills and washed them down. The last thing I remember was a kiss from my angel and I was out. Tears rolled down my cheeks as I (Patrice) walked with Justin's mom into the waiting area, leaving my husband alone to be rolled away into surgery. I didn't dare show him how upset or nervous I was. 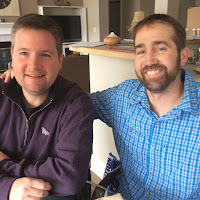 Justin told very few people about the surgery beforehand and our coping mechanism had us playing it off like it was nothing. I knew these things were true. Justin's mom, oldest sister and I nervously waited. The 5-hour surgery passed slowly for us. Believe it or not, the anesthesiologist and a nurse texted me updates and we hung onto every word. "Slow steady progress. Not unexpectedly there is a lot of adhesions from the inflammation of the Crohn's. The procedure has turned out to be involved. He is remarkably stable. All is well." When his awesome surgeon came out with news around 12:45pm, she was as patient with us as she was during the surgery. "It was not pretty in there. 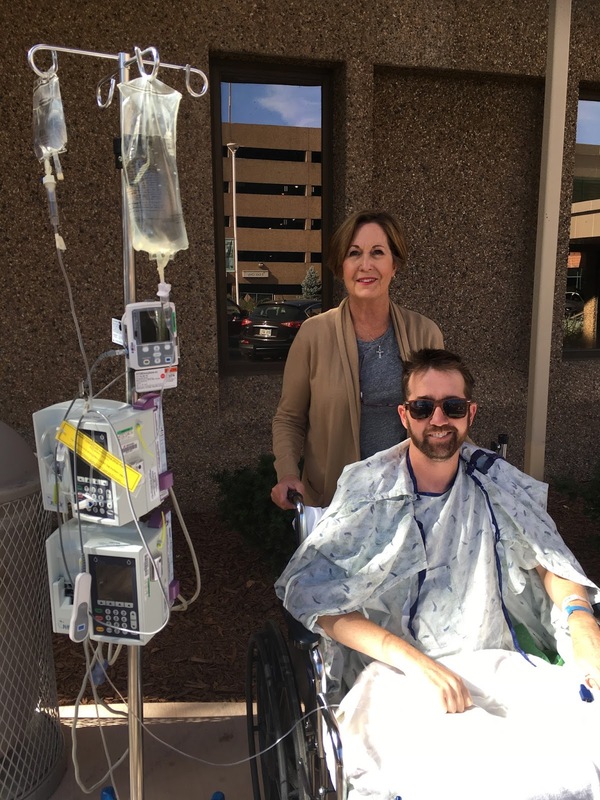 I had several doctors taking a peek and no one knows how he endured living like that." She removed about a foot of diseased small intestine (including his appendix), 6 inches of his colon that was also compromised and sent samples of the tissue for testing what type of bacteria was causing his infection and how best to treat it. What she removed was actually the "worst case scenario" she described to Justin and I months ago in her office. It had a name, or rather a mouthful: a complex ileosigmoid fistula and erosion of sigmoid colon into the sacrum because of Crohn's inflammation causing sacral osteomyelitis. The hospital liaison allowed only me, but only me, to go back to see him in recovery. After you wake up from a five-hour operation, it isn't at all like they show on Grey's Anatomy. Justin was disoriented and could barely keep his eyes opened. His lips and throat were so parched from the breathing tube and he was begging for water. He wasn't allowed to have water, let alone any liquids. The best I could do was swab his lips with a sponge and apply chapstick. It was futile; each letter he mumbled was a chunk of pumice scraping his larynx. "Did they take out my whole small intestine," he wheezed. "Do I have a bag?" "Shhhh," I squeezed his hand a little tighter. "Don't talk. Everything is going to be okay." The "bag" was the biggest source of worry for Justin. His surgeon—not knowing what she was going to find until she cut him open—said a temporary colostomy, or an ileostomy, would be a possibility. The best way to describe these foreign words in laymen terms would be a "bag for poop." A surgeon essentially telescopes an intestine with an artificial opening out of the stomach and connects it to a bag so it bypasses certain systems. So for Justin, he ended up with a ileostomy, using a piece of his ileum (small intestine) to connect to a bag and bypassing his colon so the abscesses on it could heal. Justin was so worried about having a bag and only agreed to it if it were temporary. He told his surgeon before the procedure, "if you get in there, and it is so bad that you think it will be a permanent bag, please just sew me back up." It was temporary, but she really couldn't say on the day of surgery for how long. Intestines have their own timeline for healing. They settled Justin into his room on the 6th floor around 4pm and his mom could finally see him (she sat in the waiting room pacing and wondering why I was in the recovery room for 45 minutes when they said I could only see him for 5 minutes). Justin's first time outside wasn't until Day 6! The fits of misery started right away. There was a deep aching pain and he couldn't find a position that worked. Not to mention that he was still very hooked up: he had a catheter, a drain the right side of his abdomen, the ileostomy on his left side, a 5-inch incision, two IVs, a heart rate monitor and oxygen tubes in his nose. 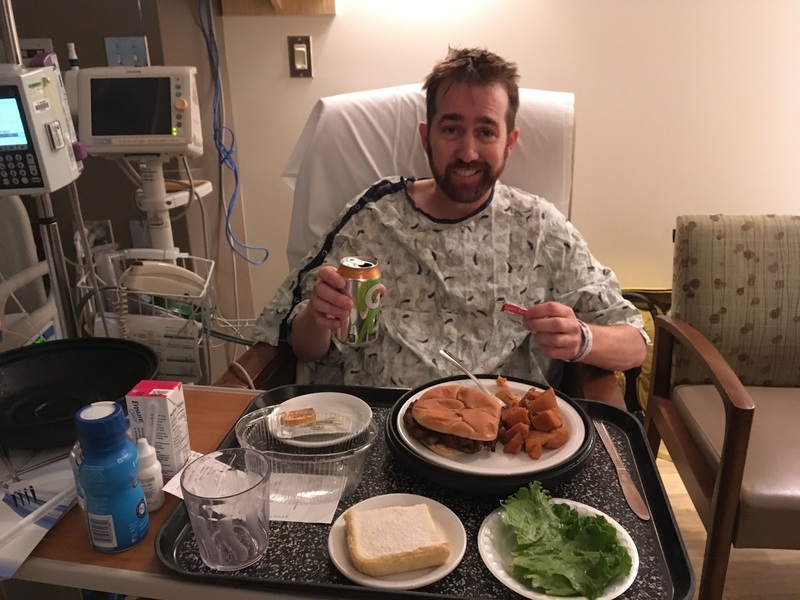 Remarkably, he was still cracking jokes, thanking the doctors and nurses, and apologizing all the time for requesting things. 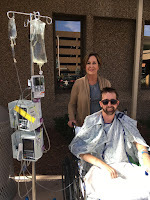 Justin's mom and I (Patrice) became the super power tag team through his hospitalization. I slept at the hospital every night, and Justin's mom took the days. Neither one of us wanted to leave him alone. It pained us to watch him, but we fed off of each other's strengths so we could be there for his every need. The first few days following the surgery were a blur for me (Justin). I have pockets of memories, like getting up to walk the first time, wondering why my pee was bright red, feeling my lips on fire, pain everywhere and being hungry. 2) Walk and move from the bed to the chair at least three times/day, and increase that movement as the days went on. Moving not only got bowels moving, but prevented blood clots. The poor guy had issue after issue. Immediately after the surgery, one of his complaints was about his left eye ... turns out taping his eyes to protect them during surgery resulted in a scratched cornea. He slept in 45-minute increments. His anxiety was at an all-time high. His throat was so dry from the breathing tube (he was only allowed to have hard candies and chew gum). The pain meds made him itchy. His skin was so tight from water retention. His belly was distended. The staples on his scar were painful. Then of course there was the "bag." An eye injury! Of all things! Watching the bag became Justin's biggest obsession and source of stress. Output in Justin's bag was not only his ticket to eat, but his ticket to being released. Just as a watched pot never boils, a watched bag never produces. Justin was checking his bag just about every 30 minutes. Asking people to pray for poop was both funny and sad. By Day 5, Justin was in a dark place of major discouragement. 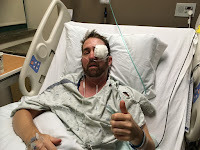 We tried to keep him positive by pointing out the bright sides--the eye was healed, the catheter came out, no more oxygen needed and there were now 3-hr stretches of sleeping instead of just 45 minutes. Luckily, both J's sisters live in Denver and 2 nephews, so there were lots of people to bring cheer. Plus, Justin had more energy to talk on the phone, so everyone was doing their best to lift his spirits. 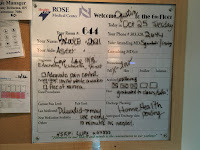 The doctors and nurses were not too worried, reassuring us that the number of days for output depended on the person. Listless and empty, Justin soldiered on. Everett said he could make Uncle Justin all better! On Day 7, the floodgates opened! I (Justin) felt like I was winning the lottery, finding gold, striking oil!!! Ok maybe it wasn't that great, but boy did I feel relief ... in so many ways. The funny thing is I had no one to celebrate with. Patrice and Mom just stepped out for a well-deserved lunch, but upon their return, they partied with me. Plus every nurse on the 6th floor stopped by with a big congrats! Even though I was so hungry, eating was tough for me. I was so nervous about blocking things up. I ordered whatever I could on the menu, but only took a few bites here and there. First solid food in EIGHT days!!! I (Patrice) left on Day 9. We had committed to caretaking Fenton Ranch in New Mexico knowing the surgery would take place and Justin may have to remain in Denver for IV antibiotics. Justin's mom was happy to take care of her son, and although I hated leaving him, I knew he was in the best of hands. On Day 10, I (Justin) was being released! My buddy, Brad, flew in from New Jersey, which was perfect timing as both my mom and I needed some help. Brad was a lifesaver, even though I could barely function and spent most of his visit sleeping. Little things really do help!